In order to fabricate new type of low carbon dual phase steel with excellent local deformability, cold-deformed lath martensite was intercritically annealed at ferrite and austenite two phase region at very high heating rate of 500 K/s by high-frequency induction heating in a low carbon chromium-molybdenum steel (0.15%C-1.15%Cr-0.15%Mo). No recrystallization of lath martensite to ferrite took place upon heating because of the fast heating and the pinning effect of very fine M3C particles. 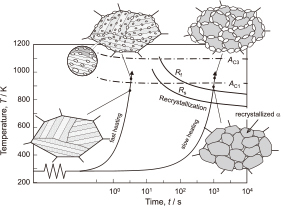 Consequently, austenite grains densely nucleated in the non-recrystallized lath martensite matrix during intercritical annealing, resulting in the formation of very fine dual phase structure consisting of tempered lath martensite matrix and finely dispersed fresh martensite grains. The very fine structured dual phase steel exhibited higher local deformability while maintaining good strength-elongation balance compared with the dual phase steel with recrystallized-ferrite matrix due to the high density of distribution of fine fresh martensite grains and low hardness ratio of fresh martensite to matrix.